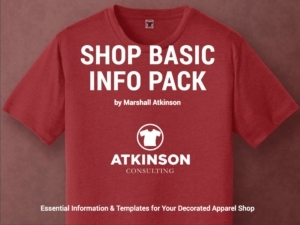 Just a quick note to let you know that you’re “Shop Basic Info Pack” is amazing! Pure Gold. There’s nothing “Basic” about it… the information and templates are concrete tools that we will begin using right away and gain an immediate ROI. We have some of these systems in place – but having a template to further refine and improve these systems and being able to use this as a training tool is priceless. Coming from an industry veteran/consultant – it also gains much more buy-in from my staff. You honestly probably need to charge more for this – but glad we got in on the introductory price. 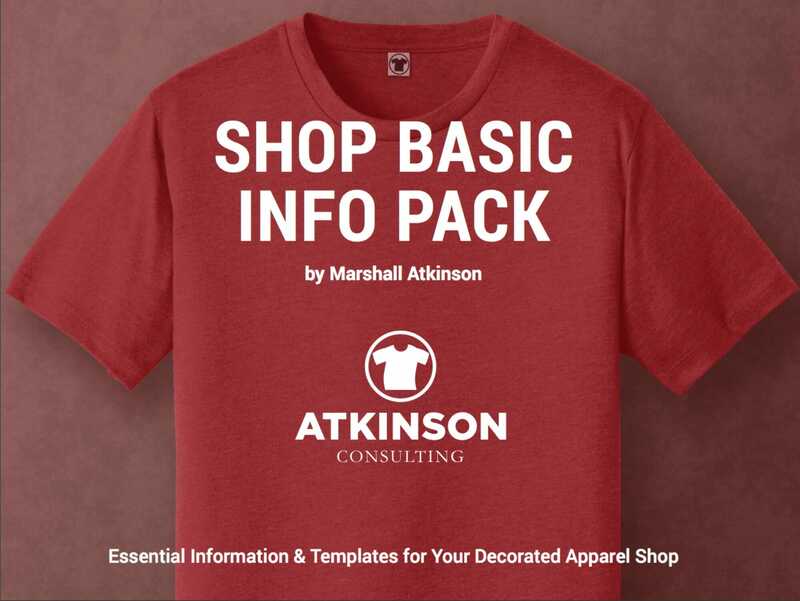 There is a lot of “knowledge” shared in screen printing and a lot of how to screen print info out there but Marshall takes it to the next level sharing extremely valuable knowledge learned from years of running production and working with other shops. Marshall is a great writer and these lessons are easy to understand and very valuable. Great investment in $ and time! If you are running or owning a shop and constantly want more. Not necessarily orders but more efficiency, streamlined operations, quicker turnarounds and just overall natural progression in productivity this is the best batch of info I have ever read. I’ve been coached by Marshall for quite some time and the info he gives is extremely valuable. This will make you a better shop owner and run your business business better! Once again Marshall’s wisdom comes at the perfect time for our shop. This book is perfect for anyone just starting out as well as the perfect checks and balances for a seasoned shop. As soon as we read it we immediately started implementing these practices. I can not wait to measure and report back on our growth. We`ve learned we can`t measure what we don`t track. Working with Atkinson Consulting we`ve implemented Excel log sheets in our business, Using the data we acquire from our Excel log sheets we make the necessary adjustments in our business and move forward. Being a screen pinter and shop owner I really, really, really love buying the latest equipment and software in our industry. I am convinced, more than any piece of equipment I could purchase for the business, nothing is going to add more to our bottom line in 2018 than to continue to work with Atkinson Consulting. 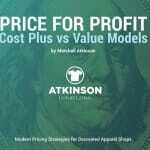 You are much appreciated Marshall Atkinson. The essentials of every shop in an easy to read ebook. For any growing shop, an employee handbook is essential to minimize risk and get some structure into your business. The production log and shop dashboard put true metrics on if your production is efficient and profitable while holding your team accountable. You can only improve what you can measure and this is the key process to measuring production in any shop big or small.